I re-activated my Esty shop again. Not as many items as last time, but more will be added later on. Up for sale. Custom made, one of a kind numbered mixed medium postcards. Featuring my illustrations. Just specify the type of design or illustration you’re looking for. Below are just two examples. 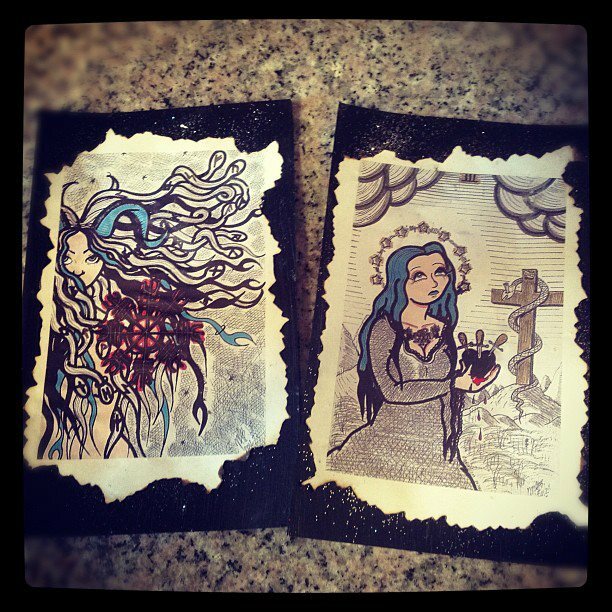 Custom made mixed medium postcards by Michele Witchipoo. 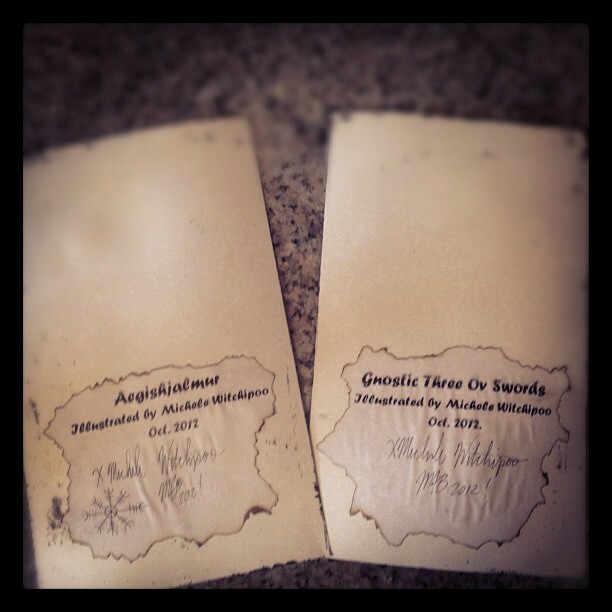 These two were created Fall 2012. Available for custom order on Esty. No two are alike. All are signed and numbered on the back. Custom postcards by Michele Witchipoo. On the back of each custom created card, signed and numbered. No two are alike. Based on Babalon Babe illustrations by Michele Witchipoo. I also accept PayPal with the email: witchipoo@witchesbrewpress.net. Just specify which issue you would like when ordering. We interrupt this blog for an important announcement. Starting from April 15 to April 30th, 2013 you can vote in the Inkwell Awards. The Inkwell Awards is a non-profit organization dedicated to the education and promotion of the art of inking. Inking is a much over-looked but crucial element to the comic book process. Everyone is encouraged to vote, whether you’re a fan or professional. The only difference this year is that the public is not allowed to vote in the The Joe Sinnott Hall of Fame Lifetime Achievement category. The winners will be announced live at Heroes Con in Charlotte, NC June 7-9 2013. For more information, please click on the above Inkwell Awards link. 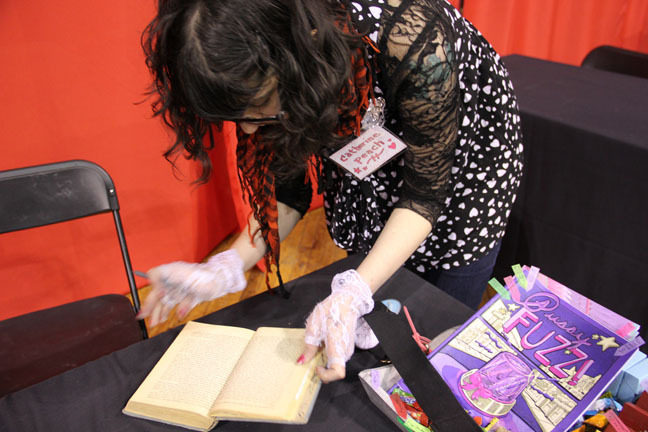 Last weekend I did the Mocca Fest 2013. Might’ve mentioned this before, but originally I wasn’t planning to do the weekend event. Due to school and doing projects for other people, I hadn’t done any of my own stuff. In other words I didn’t have any new self-published comics of my own. 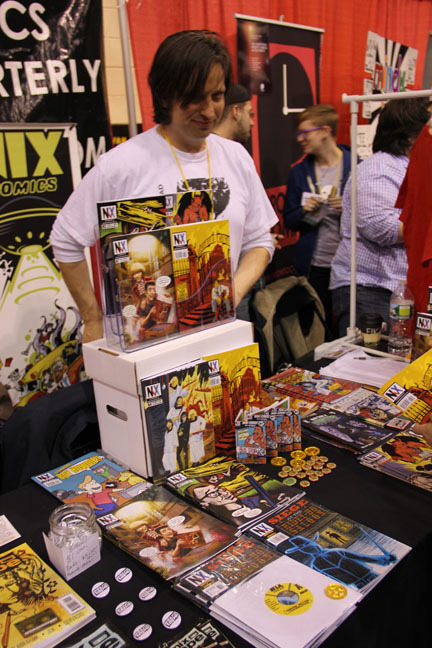 Then a month before Mocca happened, someone offered me table space. Overall I’m glad I took up on the offer. It had been over a year since I did any sort of comic book convention, so there was some rustiness. Through trial and error I discovered some facts. 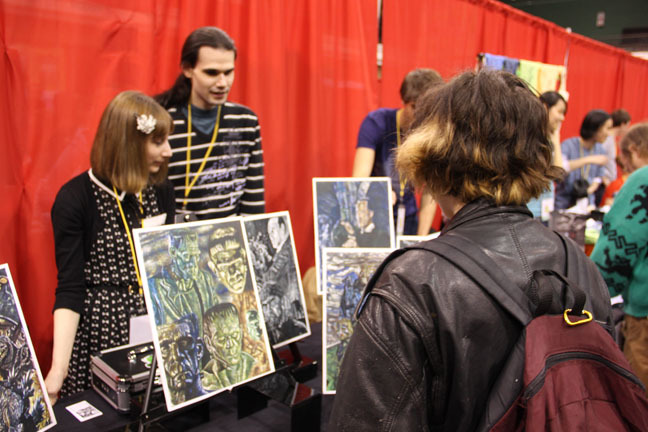 Also to my surprise I learned that people were still interested in my self-published comic Psycho Bunny. It’s this little zine/comic that I’ve been doing on and off for about ten years now. What also took me by surprise was people were most interested in Psycho Bunny than my esoteric pin-up sketch book Babalon Babes. 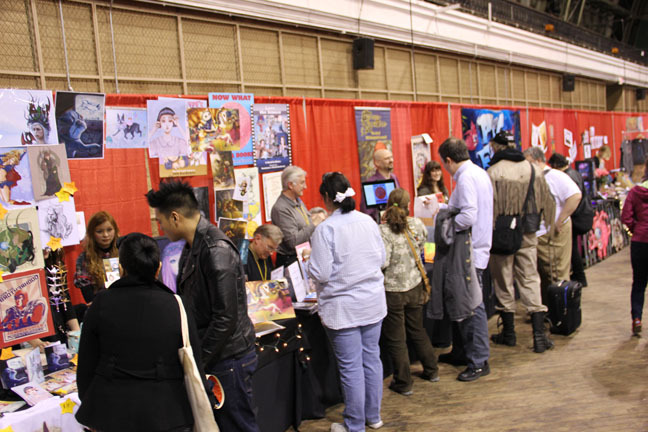 In the past, the interest in both comics/zines were sort of equal. This year, readers went more or less for Psycho Bunny, an ongoing tale about an alcoholic rabbit who dwells in urban chaos. It was also interesting because I had been thinking of dropping Psycho Bunny altogether. I’ve wondering about heading in a different direction. After all, I’ve been meaning to do this cat webcomic. Then came the Mocca show, and was proven contrary. It also felt good to be back. Again, despite no new material of my own, there was still some interest in my work. I was trying to downgrade so I didn’t bring everything I had done within the past year/two years and a half. That would’ve been impossible to lug back and forth to the show. So this time around it was back to the basics. Besides, I kinda wanted to sell off some old material before setting forth on the new. A spring cleaning of sorts. As for the weekend itself, the convention was packed. In the age of Nooks, Kindles and webcomics, people were still into buying indie hard copies. So in the end maybe it’s better to have a balance of everything. Perhaps readers are more interested in paper for the indie work, and digital for the more established. Time will tell. One of the original Punk rock cartoonists was also there, John Holmstrom. Alas, I didn’t go meet neither Fingerman or Holmstrom. There was my own table to tend to, and not a lot of room to move around if you wanted to leave your space for a bit. Holmstrom was there promoting his new book The Best of Punk Magazine. 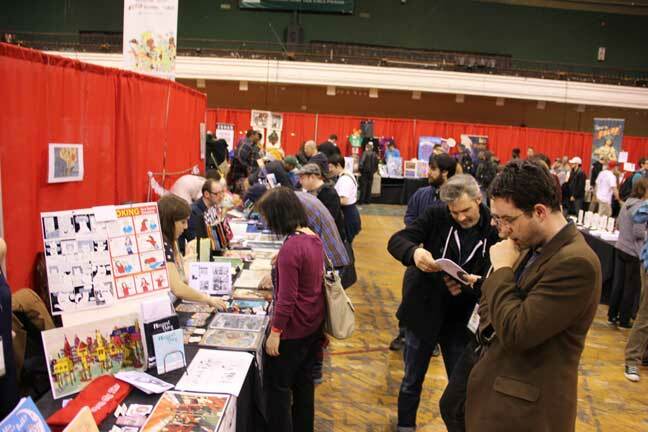 The vibe was completely different at Mocca since merging with The Society of Illustrators. For starters, the fest was a lot more organized. I remember Mocca when it used to be at the Puck building, but the fest outgrew that venue a long time ago. For now Mocca still calls The 69th Regiment Armory its annual home. Now I don’t know if it was me, but the crowd itself seemed to be a bit more conservative…? Not sure how to put it quite in words. Again, maybe it’s a sign of the times. Who knows. With Mocca there were always parents bringing their children, but this year there seemed to be more families there. I could be wrong but that was just my observation. Again, I think it’s a reflection of what’s been happening in New York City itself, as it slowly develops into a more suburban mindset. Much to my chagrin. 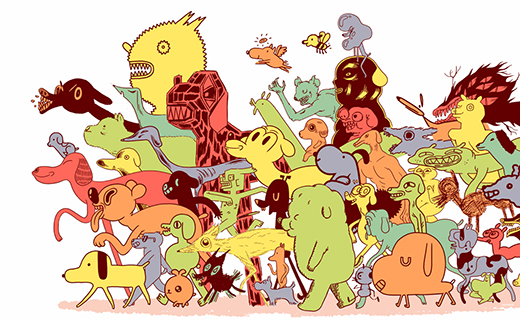 Maybe I’ll do another post about Mocca Fest 2013. I’m still processing the event somewhat. In the meantime, here’s some photos courtesy of Paul Curtis, one of the publishers who complied the book on cartoonist Luisa Felix. Photo taken by Paul Curtis. Mocca Fest 2013. Photos by Paul Curtis, who was nice enough to let me use his pics for this blog post. You can be one of the first to get your own copy at the MoCCA Fest this weekend at table C91. 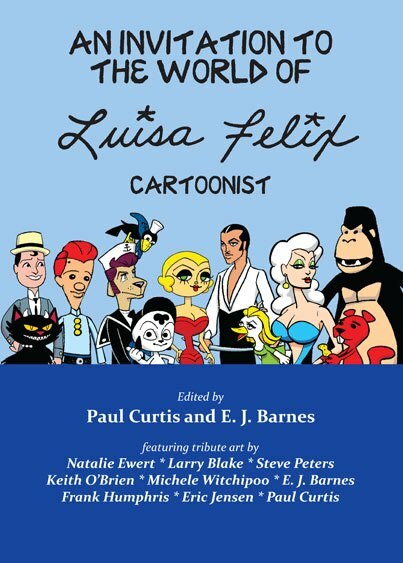 An Invitation To The World Of Luisa Felix, Cartoonist. The 100-page book has been printed in a limited edition of 250 hand-numbered copies, and each copy will contain a small sample of original Luisa Felix art. Nine artists (also contributed to the book. The art incorporates some of the many characters Ms. Felix created over her forty-year career. The book is a joint publication of Drowned Town Press and Micro-Comics. An Invitation To The World Of Luisa Felix, Cartoonist. The 100-page book has been printed in a limited edition of 250 hand-numbered copies, and each copy will contain a small sample of original Luisa Felix art. Nine artists – Keith O’Brien, Michele Witchipoo, Steve Peters, Larry Blake, Natalie Ewert, Frank Humphris, Eric Jensen, Paul and myself – have also contributed tribute art incorporating some of the many characters Ms. Felix created over her forty-year career. The book is a joint publication of Drowned Town Press and Micro-Comics. If there are any copies left after the Mocca show, you might be able to order either through this website, or contact Paul Curtis. At the moment, your best bet is to purchase the book at the Mocca Fest. Any further updates will be posted. Hi everyone. Just a brief mention about this upcoming weekend. Yes, that’s right. Promotion, promotion, promotion. 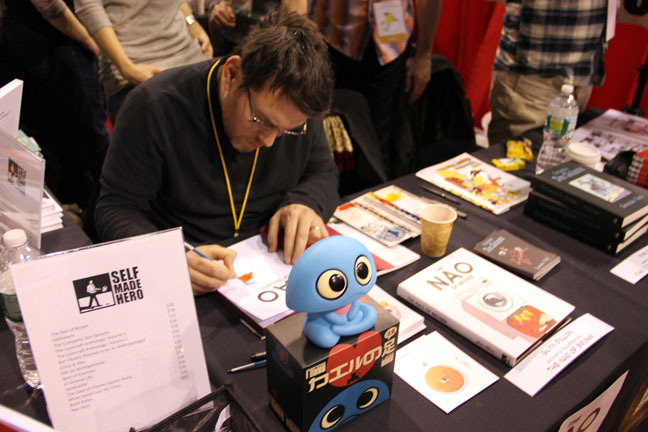 You can find both this Saturday and Sunday at the 2013 annual Mocca Fest, table C91. I’ll be sharing the table with two other cartoonists. So come by and buy some stuff from me. My comics will be available. Maybe some prints of my artwork. So come by and say hello. Unless you hate me. If that’s the case, fine by me. I don’t need to see your face. Post Easter Thoughts and The Beltane Bunny. 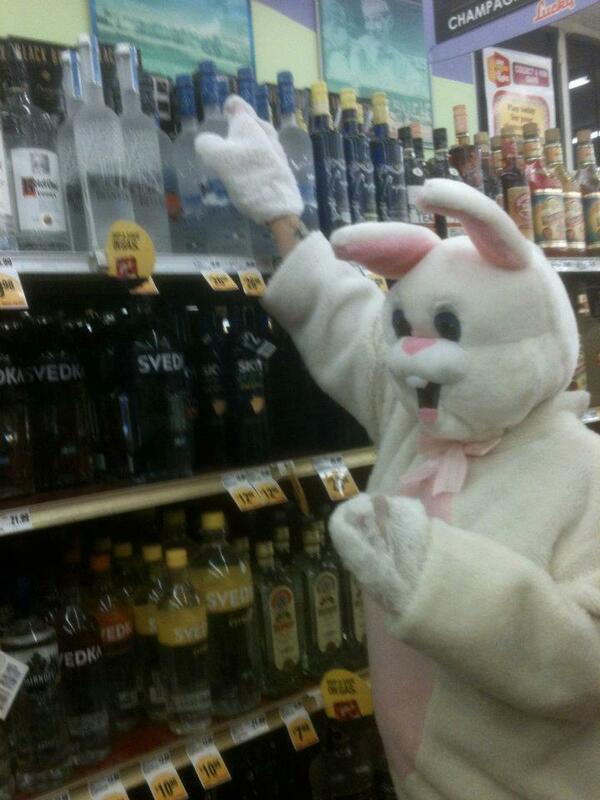 As a child I wasn’t into celebrating Easter all that much. Just remember new outfits and sometimes the family would walk through Central Park. I got Easter baskets complete with a chocolate bunny. Another Instagram photo. 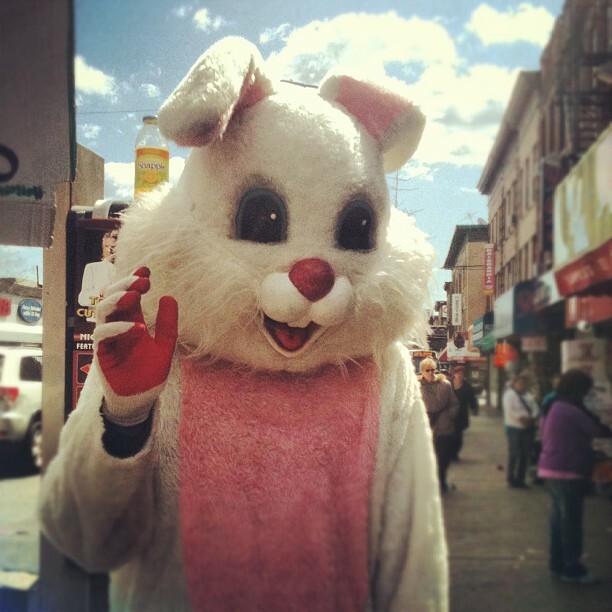 Red right hand bunny. Must be a Nick Cave fan. Bad joke. Photo by Michele Witchipoo, March 2013. March 2013. It seems as if everyone was making a big deal about various Spring holidays more than usual. Probably because it just seemed like the longest Winter ever. Even I got tired of the Frost Giants. Apparently The Hrimpursar had overstayed their welcome. This year I had dinner with my parents. Now I realize that I was raised as an only child within a dysfunctional family. Which sorta explains my perspective and sense of humor. Yet surprisingly it was nice for a change. I showed up solo to dinner. My mother gave me my birthday presents along with parental warmth. My father didn’t get on my case for a change. Afterwards both me and my mom watched of all things this feminist documentary. It was broadcasting on some public television station. When I was growing up, I cannot recall my mother embracing any type of feminist concepts. Odd, but another pleasant surprise. Then mom asked me if I ever watched that CBS reality show ‘The Amazing Race.’ It was then I realized my mother always liked to travel. 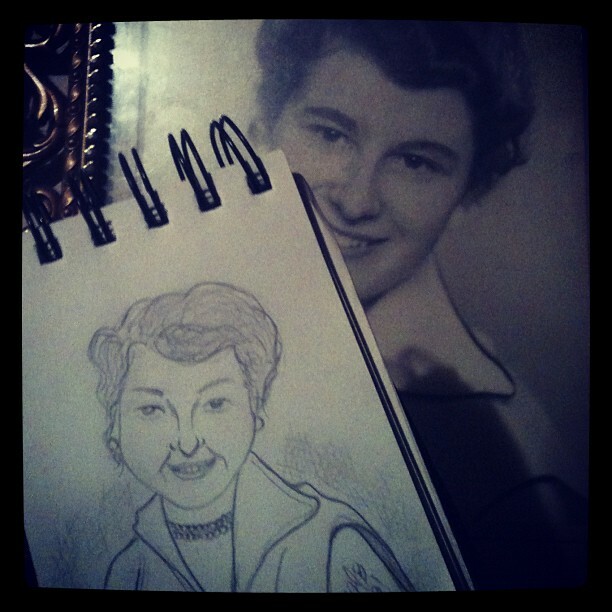 After dinner I did a quick sketch of my mother. Photo from when she was either in her late teens or early twenties. In her single life she was doing exactly that. During the late 1960s, my mother arrived on the U.S. shores looking for work as a nanny. Originally she planned to head back to Liverpool, England, but not before she had a taste of the American life. Then one night she decided to check out the Roseland Ballroom. That visit changed her life. She met a man who would known as my father. He convinced her not to go back to the U.K. and stay with him. Then they spawned me and completely ruined everything. I joke. Well sort of. They’re still together after all this time. Along the way they slowly accepted my ever changing tastes in music, hair colors and a love of all things dark. Do I ever want to be like them? Hmm…yes and no. My mother will always have a kind, compassionate heart. She can never be as incorrigible as me. We’re both cat lovers. Guess it runs in the family. A friend of Psycho Bunny? Must be tough hiding all those eggs. At least he goes top shelf. Found this photo on Facebook. Best bunny pic of the year. Photographer unknown. Beltaine Bunny. Watercolor. March/April 2013. Created by Michele Witchipoo. Here I am with the shimmery glitter watercolors again. Of course you can’t tell that it’s glitter watercolor due to the scan. Once again. Anyway, I combined two of the spring holidays here. Easter and Beltane. Easter and Beltane really have nothing to do with each other, except for the pastel colors. Yet I missed Ostara and Spring Equinox. So I figured I would do a nod to Easter while waiting for Walpurgisnacht.